A new development by DeMartini Fletcher at Stones Corner has been given approval after undergoing design amendments to meet local planning requirements. The Residential project located at 20 Stoneham Street Greenslopes is the second development (the first being Stone & Co, Developed by Blue Sky) to mark a new era of medium density living for the Stones Corner village area. It is a stones throw away from UQ St Lucia Campus, Buranda bus and train station, the Gabba, Kangaroo Point and the PA Hospital. Fortitude Valley and West End are just a short drive, along with the M1 motorway. 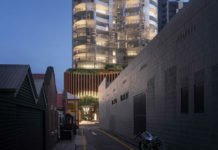 Amendments to the project included relocating a transformer away from Stoneham Street as it was blocking street activation of the pre-1911 building. An access lane that allowed access from both Montague Street and Stoneham Road was also amended, replaced with a relocated basement driveway to the southern end of the site, and an access easement to the northern end of the site, reducing probable traffic conflicts to Montague Street. The retention of the front fence of the pre-1911 building was also required by the council amendments. Designed by Ellivo Architects for developer DeMartini Fletcher, landscaped areas have been integrated into the ground plane and the podium level. Greenery is extended up the tower through the use of vertical trellises connecting external circulation foyers, further highlighting the use of greenery. Moving up the tower form, the strong horizontal banding of each level is juxtaposed by a clean expression of solid and glass balustrades, curtain walls and sun/privacy screens. Sculptural precast panels to north and south boundaries create an organic form to the tower, providing privacy from any future neighbouring developments adjoining the site. They are solid on the lower levels of the tower (level 1 to 7) and open up as the tower rises providing a subtle break to the elevations. This break is also emphasised by changes of the façade materials with a strong use of glass to the upper levels. In a nod to the materials present in the existing pre 1911 building, a face brick finish has been extended along the ground plane and up the tower. Apartment interiors have been designed to integrate with the architectural design and provide exclusive apartment living. All unit types incorporate well-appointed bedrooms and open plan living and dining areas opening onto spacious balconies and terraces. The DA number for this development is A004053058.